The Pens were rolling as January turned into February, having won 5 of 6 games and looking poised to overtake the Rangers for 2nd place in the Metro. But with Evgeni Malkin and other forwards out of the lineup, the Pens were only able to tread water and quickly lost pace in the division. They enter the game 4th in the division, but they'll play 3 more games against each of the two teams directly in front of them. The first will come tonight against the Rangers, and it's almost a must win if the Penguins want to keep alive the hope of home ice advantage in the first round. The Rangers are 8 points ahead of the Penguins with 20 games left to play, but Pittsburgh has a game in hand and if they can sweep the Rangers the rest of the way they'll make it a very tight race. It's the 2nd game between the two teams this season, and the Pens weren't able to solve Henrik Lundqvist int he last outing, losing to the Rangers 3-0. The Rangers made one of the bigger trade deadline deals when the acquired Eric Staal from the Carolina Hurricanes in exchange for a 2016 2nd round pick, 2017 2nd round pick, and prospect Aleksi Saarela. It's been a rough year for Staal, who has 10 goals and 23 assists through 64 games played, which has him on pace to have his worst seasons totals for goals and assists since his rookie season in 2003-04. The Rangers are hoping that he'll find his game playing on a deeper team in a role more suited to where he is in his career. Henrik Lundqvist started the season slowly, by his lofty standards at least, but he's found his game as the season winds down and has posted a 1.69 GAA and 0.939 SV% in his last 10 games, leading the Rangers to a 8-2-0 record during that time frame. The prospect of Lundqvist playing at his best entering the playoffs is a scary idea to whoever draws the Rangers in the 1st round and beyond, and it make a Metro Division with the league leading Washington Capitals just that much harder. With the strength of the Capitals and the matchups problems the Rangers possess, it wouldn't be the worst thing in the world for the Penguins if they ended up in the first wild card spot and found themselves in the Atlantic Division bracket. If the Rangers can continue to play well offensively, and they're 7th in the league this season with 2.81 goals/gm, then having Lundqvist play at this level could push them over the threshold towards being serious contenders. And they're managing to do it with scoring throughout the lineup. Mats Zuccarello (21g, 26a) and Derrick Brassard (22g, 24a) are neck and neck for the team lead in scoring, but after them it's a drop-off to 3rd place. But the Rangers have 11 players with 20 or more points and 8 with 10 or more goals roughly three quarters of the way through the season, and that's not including Eric Staal. For reference, the Pens have 8 and 6, respectively. 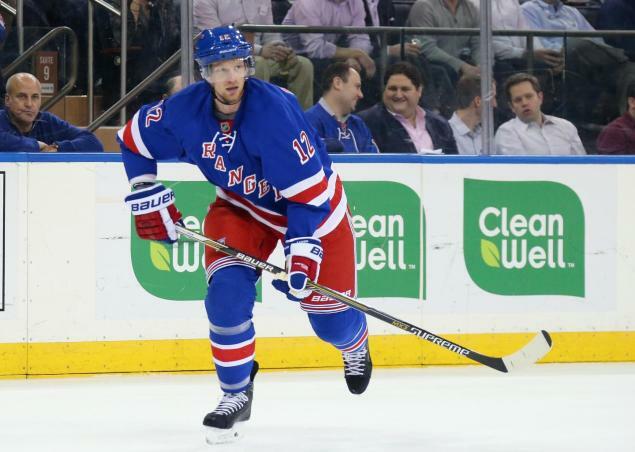 And New York is on the verge of getting a boost to their offense when Rick Nash (12g, 21a in 45 GP) returns. Nash has been out since January 22 with a leg injury, and he just resumed skating today. Inserting Nash back into the lineup could make a team currently playing great hockey that much deeper. - Justin Schultz arrived in Pittsburgh yesterday and took the morning skate with his new teammates today, but he won't play tonight against the Rangers as Mike Sullivan wants him to take in a practice before participating in a game. - The World Cup of Hockey initial 16 man rosters were announced yesterday, and 4 Penguins made the cut. Evgeni Malkin will represent Russia, Olli Maatta will represent Finland, Sidney Crosby will represent Canada, and Matt Murray will play for Team North America, which is drawing from any Canadian or American players who are 23 years old or younger.